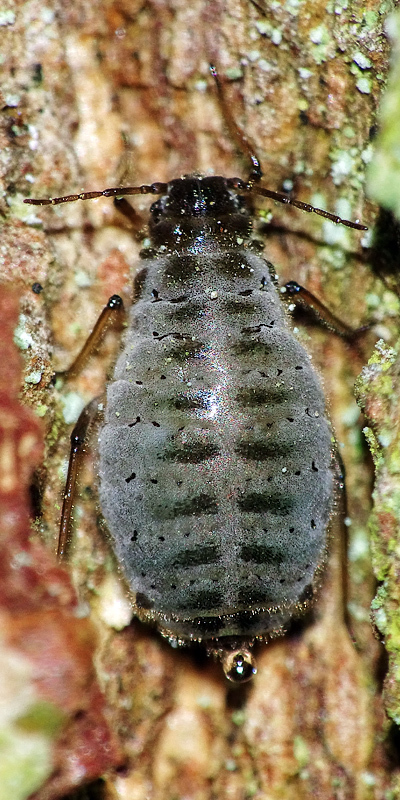 Stomaphis are large or very large oval aphids which are characterized in the females by a very long rostrum. Their antennae are 6-segmented and densely hairy. Their siphunculi are pores on low, haired, cones. The second segment of the hind tarsus is rather long compared with other lachnids. Males are small, apterous and have no mouthparts. Stomaphis feed on the stems and roots of a variety of tree species, with most species on oak (Quercus), birch (Betula), maple (Acer), willow (Salix) and poplar (Populus). Adult apterae of Stomaphis quercus are elongate oval shining dark brown (see first picture below). They have numerous densely placed, thin, erect hairs on the body, antennae and legs. The antennae are dark, about 0.4 times the length of the body, with antennal segment 3 paler than the others. The rostrum is exceptionally long, in the adult nearly twice as long as the body, more so in immatures. There are dark spinal spots on abdominal tergites I-VI and cross bars interrupted in the middle on tergites VII and VIII. 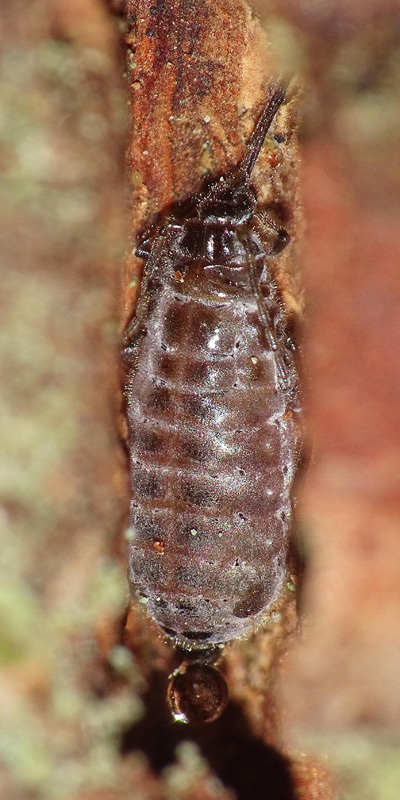 The body length of Stomaphis quercus apterae is 5.3-7.0 mm. First image copyright Bernhard Seifert, all rights reserved. Second image copyright Brian Eversham all rights reserved. Given its size, the alate has rather small wings and the wing veins have brown borders. Immatures are a paler brown than the adults with a rostrum proportionately even longer than in the adult (see second picture above). Stomaphis quercus is found on several species of oak (Quercus), and sometimes also on birch (Betula). It is always ant attended, normally by Lasius fuliginosus (see picture above), but sometimes by Lasius brunneus. Sexual forms occur in September-November. The species is rare in UK and may be locally extinct. Its stronghold was Breckland, East Anglia which is now largely under agriculture. Stomaphis quercus is found throughout Europe and in west Siberia. The apterae of Stomaphis wojciechowskii are light fuscous to light brownish, in colour (see first two pictures below) with darker spinal sclerites (cf. 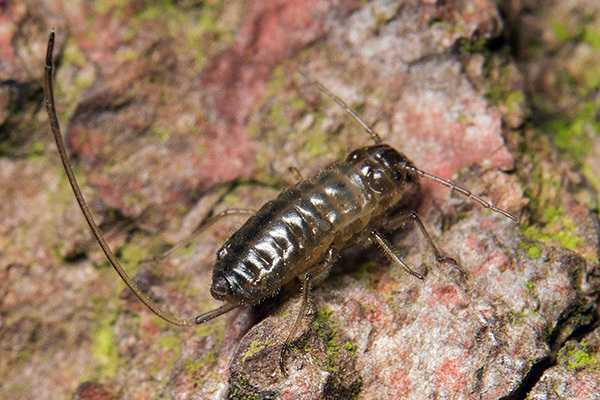 Stomaphis quercus which is dark green to dark brown, shiny and lacks clearly visible spinal sclerites). The first image below shows a Stomaphis wojciechowskii fundatrix, which is distinguished by having the paired spinal plates wider than long, and the second shows a rather old (possibly post-reproductive) apterous vivipara with the paired spinal plates approximately square. 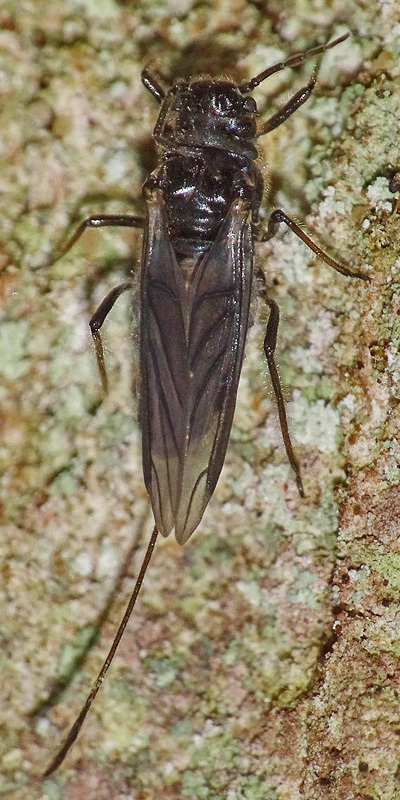 The extraordinarily long rostrum (visible in the third image below) is up to twice the body length (rather more in nymphs). The Stomaphis wojciechowskii aptera has numerous densely placed, erect hairs on the body, antennae and legs. The ratio 'length second hind tarsal segment (HTII) / length first hind tarsal segment (HTI)' is less than 2.85, with an average of 2.71 (cf. Stomaphis quercus where this ratio is more than 2.85 with an average of 2.95). The ratio "HTII / length second mid tarsal segment (MTII)" is less than 1.31, with an average of 1.28 (cf. Stomaphis quercus where this ratio is more than 1.31 with an average of 1.33). For fundatrices these criteria are slightly different (see Depa & Mróz, 2012). The dark grey siphuncular cones are rather small. The body length of wingless adults is 5.2-6.8 mm. The images below show a fundatrix, an adult aptera, and an alate Stomaphis wojciechowskii. The winged dispersive form, or alate, shown in the third picture above, has rather short narrow wings with brown-bordered veins. 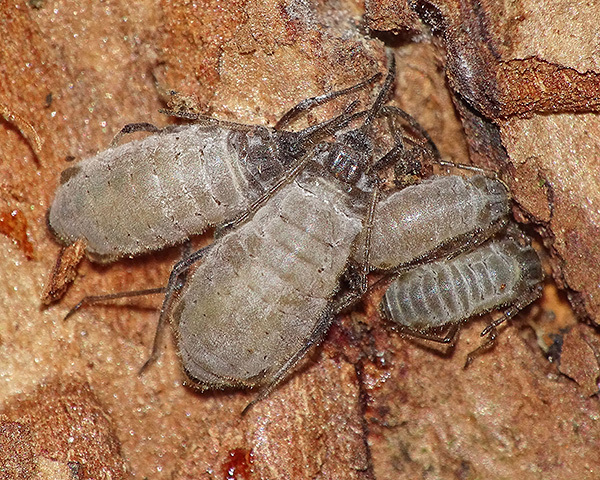 Stomaphis wojciechowskii has a wide host range which includes several oak (Quercus) species, alder (Alnus glutinosa), walnut (Juglans regia, Salix species (unidentified) and lime (Tilia cordata). 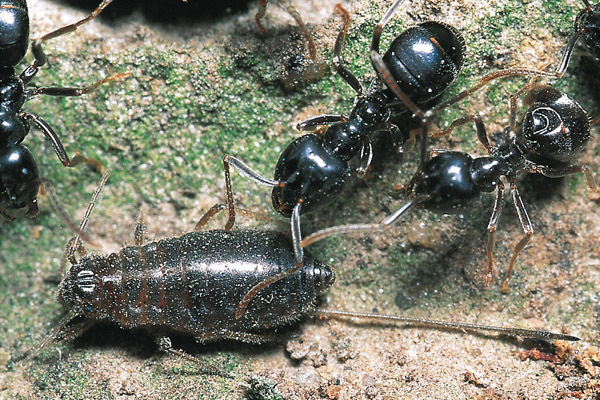 Stomaphis wojciechowskii is nearly always closely attended by ants, usually the brown ant Lasius brunneus (cf. 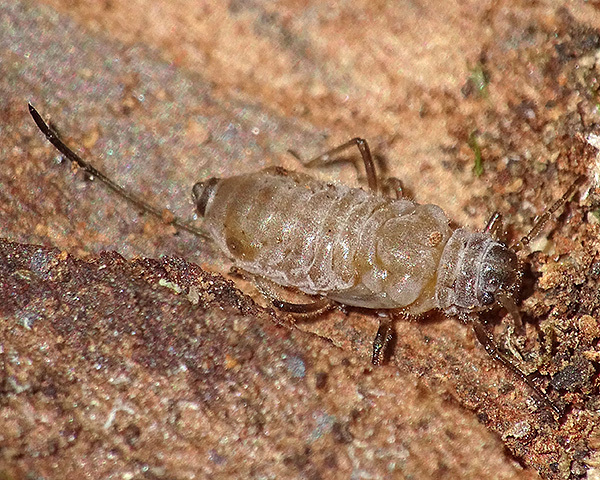 Stomaphis quercus, which is usually attended by Lasius fuliginosus). Sexual forms, oviparae and small wingless males, occur in September to early November. Stomaphis wojciechowskii has been recorded from Central and Eastern Europe (Poland, Hungary, Romania, Slovakia). Until this report in July 2018 it had not previously been observed in Britain, but is now known to be widely distributed at least in Cambridgeshire. Our especial thanks to Bernhard Seifert (Senckenberg), Julian Hodgson and Brian Eversham whose images we have reproduced above.